﻿ Cristiano Ronaldo: "I already knew they were going to provoke me"
12.11.2011 » Cristiano Ronaldo: "I already knew they were going to provoke me"
With FIFA's Balon d'Or decision coming closer (January 2012), there seems to be a bigger motivation for some football fans to provoke and tease Cristiano Ronaldo. The Portuguese player commented the issue after the 1st leg playoff against Bosnia-Herzegovina and assured he followed his game plan of remaining calm, in order to avoid any setbacks. Portugal came back from Bosnia with an important draw, but one of the main issues keeps being the way Cristiano Ronaldo has been provoked and teased. Not only in the days preceding the game, as well as during the match itself, Bosnian fans did everything they could to annoy Ronaldo and to get under his skin. However, the Portuguese player confessed that he was already expecting it and that he managed to remain calm, mostly to avoid being shown a yellow card, which would deny him the possibility of playing in the 2nd leg. Cristiano Ronaldo: "I knew they were going to provoke me in every possible way, but since I was in risk of being suspended if I was shown a yellow card, I remained calm and I didn't react. At least this way, I didn't jeopardize the chance of being able to help the team on the 2nd leg", noted the Portuguese player, who was still visibly angry with everything that has happened in Bosnia. Still under the same topic, one of journalists asked Ronaldo if he wanted to comment his middle finger gesture made last Thursday. The Portuguese player attempted to dodge the issue, but ended up by leaving a few remarks. Ronaldo: "There's no point in talking about that anymore. I'm already used to these kind of situations. People always talk about the gesture but they seem to forget about the 5 lasers I was being pointed to my face and my eyes. It's all about my reaction, since the rest doesn't seem to matter...", said Ronaldo upseted with the way some media approached the incident. Regarding the match itself, CR7 was very critic with Zenica's pitch turf/grass. Ronaldo: "This was more of a garden than a football pitch. We knew the "garden" was in bad conditions, but still, we had four chances to score and they only had one, close to the end. We'll now play in Portugal, with our supporters cheering for us, in a great football pitch, so we have nothing to be afraid of. We have to assume being the favorites if we want to be in EURO 2012. We always have to be the favorites on these kind of matches. We'll play at home and I'm confident we'll have more luck than we had on this game. We'll put on a good show", promised Cristiano Ronaldo previewing the 2nd leg clash between Portugal and Bosnia, to be played in the "Estádio da Luz" (Lisbon), this Tuesday. Just a few days ag, the former French glory, Marcel Desailly, commented about the fact that a big team never plays two playoffs in a row (WorldCup 2010 and now Euro 2012). 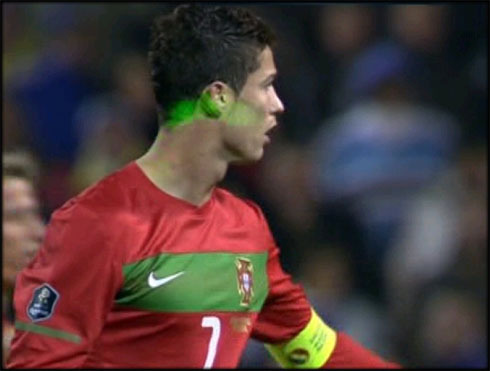 However, Cristiano Ronaldo preferred to avoid discussing the matter: "We tend to ignore those kind of comments. What I can say is that every National Team go through hard times and cycles. We had a good qualification stage, but then we had a bad result. No matter what, if we win our next match against Bosnia, I'm confident we'll have a great EURO 2012 campaign." 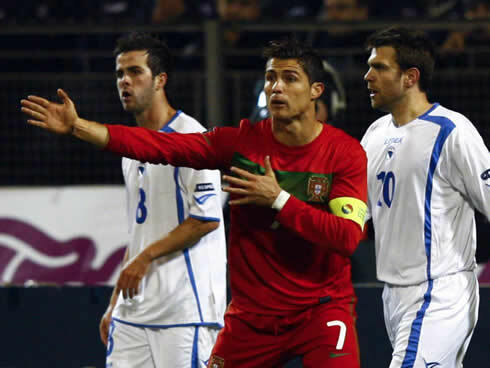 After the draw against Bosnia, in Zenica, Cristiano Ronaldo next game is against Bosnia once more, this Tuesday (15-11-2011), for the 2nd leg of the EURO 2012 playoff. Real Madrid next match is against Valencia, for La Liga, in the 19th of November 2011. You can watch Juventus live stream, Portugal vs Bosnia in our Football live streams section this Tuesday, but later today, don't miss the International friendly between England vs Spain live.